Items are picked up on your trash day. Metal may be picked up on a different day. 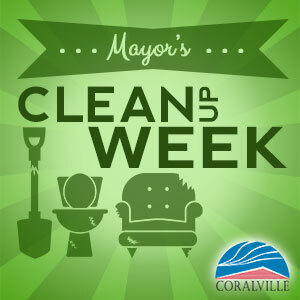 Held in the spring and fall, Mayor's Clean Up Week is a great time to set out items too large to fit in your garbage cart, such as broken furniture and bathroom fixtures, for free garbage pickup. Keep usable items out of the landfill. Donate unwanted, but usable, building and housing materials to Iowa Valley Habitat for Humanity ReStore (2401 Scott Boulevard SE in Iowa City). ReStores sells the items and the proceeds support Iowa Valley Habitat for Humanity; donations are tax-deductible.